An ascended master teacher for the Age of Aquarius and she energetically holds the evolutionary blueprint for humanity. I am a Channel for the Ascended Master Sarah, Daughter of the Magdalene and the Master Jesus. Through my work, you can receive attunements to her unique energy and learn how to apply her wisdom teachings to your own life. She teaches us simple practices that we can use in our daily life with profound results. Sarah steps forward now to walk by our side as we learn how to come into our own mastery. 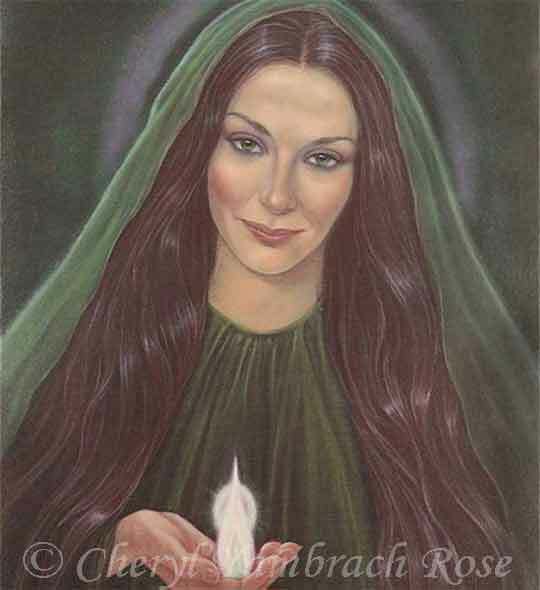 This is a print (3.5inches by 5.5/9cm by 14) of the beautiful oil painting of the Ascended Master Sarah painted by the visionary artist Cheryl Yambrach Rose. I will energetically channel a blessing for you from Sarah into the print. Sarah’s circle is a closed group, where you can work more intensely with her energies.! To receive updates and news about Ascended Master Sarah you can sign up here.